The Gibson pop-top first emerged in 2008 and represented a change in direction for Melbourne-based Trakmaster. 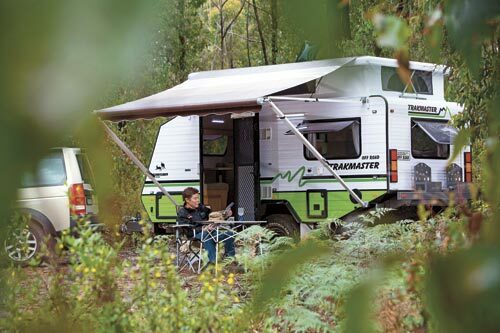 It has since developed in to a sturdy and reliable camper with several add-ons during its six year history. 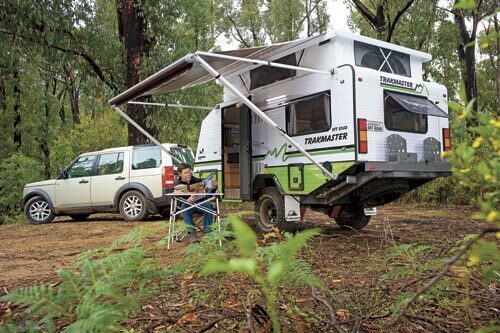 The timber-framed construction, excellent Sugarglider independent coil-spring suspension, severe rear cutaway body work and modest dimensions are just a few reasons of why Trakmaster have delivered on this reasonably-priced camper. With its sleek, aluminium-clad sandwich panels and corrugated stucco-finish aluminium cladding, the Gibson has an old-fashioned feel to it. 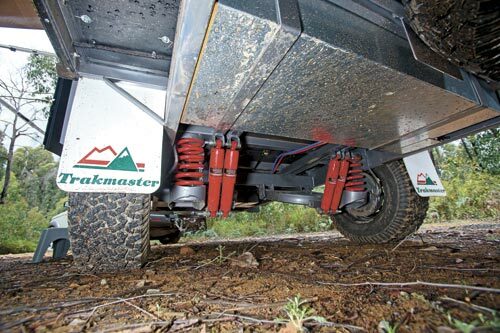 Yet, with its sturdy and full 150x50mm chassis, aggressive rear cut-away body, huge ground clearance, rugged independent 6in coil spring and large bore shock absorber suspension, extensive under-body shielding and many thoughtful features born of Trakmaster’s 18 years of industry experience, there’s no doubting its capability. 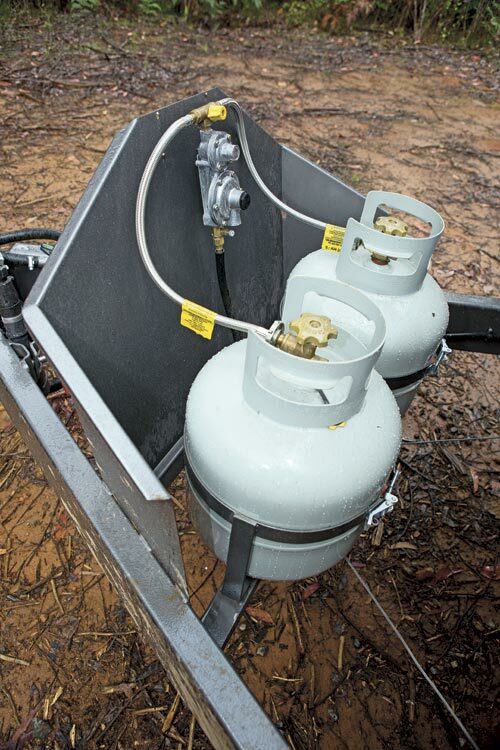 Trakmaster’s 1990kg ATM allows you to pack up to 300kg of gear on top of what fills your two water tanks, three jerry cans and twin 9kg gas bottles — the latter, with their regulators, braided steel and flexible hoses, are protected by a substantial stone shield. 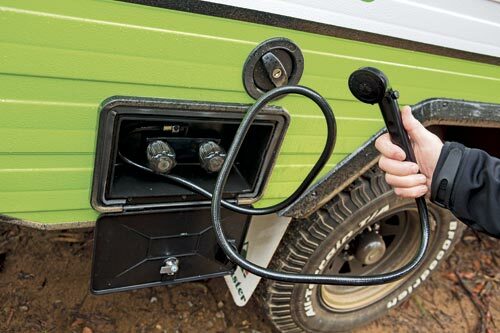 Up front, the relatively slim boot is large enough to house your jockey wheel, hoses, power lead and so on. 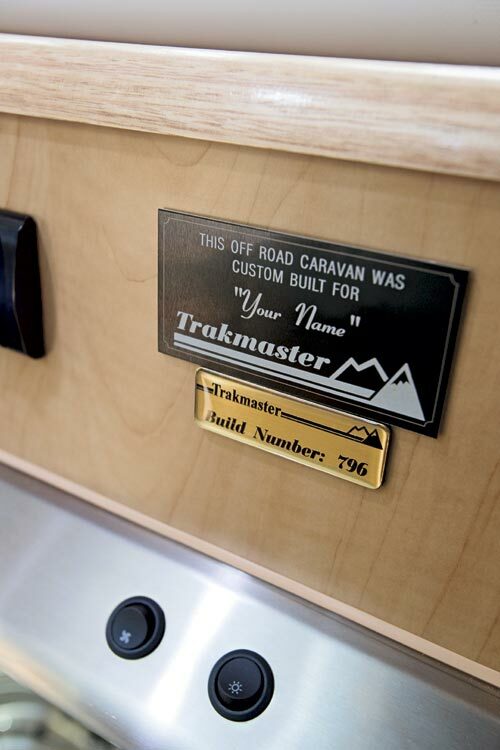 Behind our Land Rover Discovery 3, the little “Trakky” felt totally at home on every surface. We even forgot it was there a few times — including at the Metec Driver Training centre in Colchester Road, Kilsyth, where it took some very steep and slippery inclines that really showed the value of the Gibson’s great ground clearance and rear cutaway. 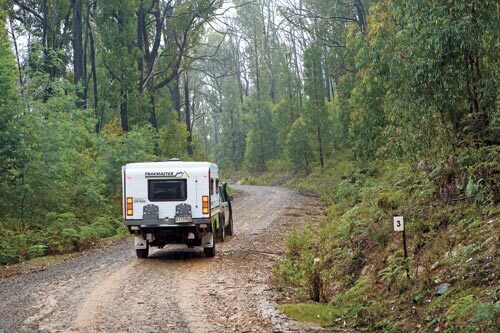 This is a true offroad hybrid that you can really take to most places that you’d be brave enough to take your 4WD. Its 2.4m travelling height is really its only limitation on overgrown tracks. 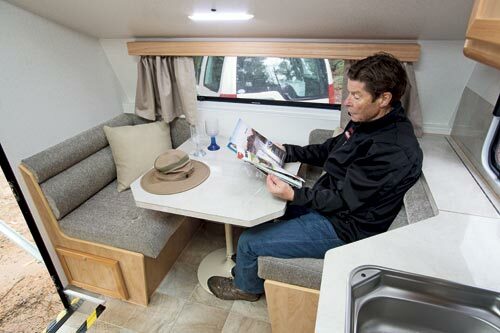 To nit-pick, the headspace above the dinette is limited by the sloping roof, and those sliding curtains without any means of holding them back look a bit antiquated in these days of combined block-out/flywire windows. 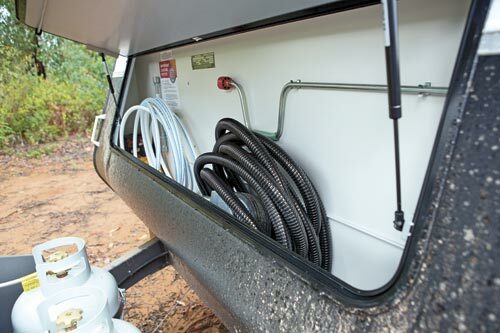 On the plus side, the eye-level cupboards around the base of the pop-top, combined with storage space beside and under the lounge and bed and beside the fridge, swallow an enormous amount of stuff. The length of the Gibson means no internal ensuite. 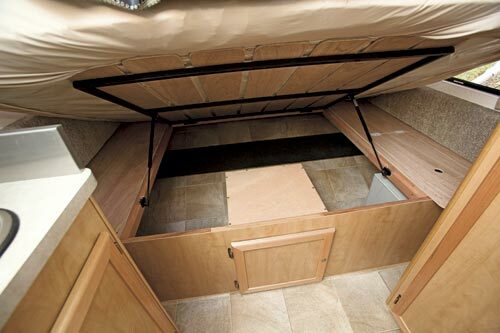 Rather, it’s got an easily erected tent supplied for the optional external shower that, which does the job admirably. 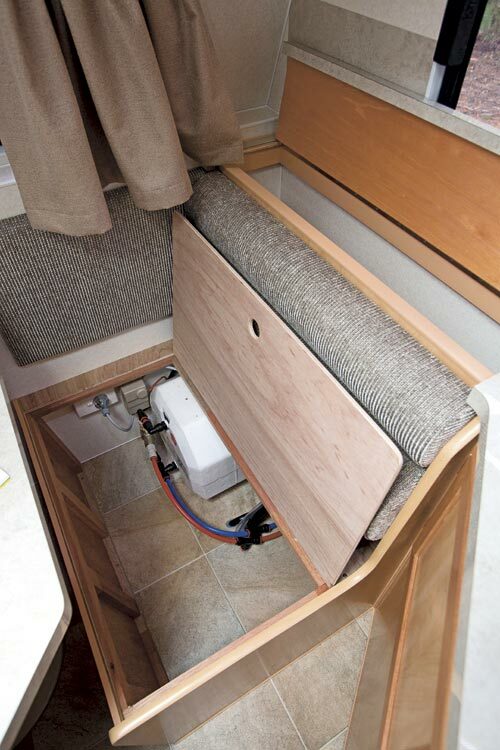 What it does have, though, is a dedicated locker under the centre of the bed to house a standard-size portable toilet. 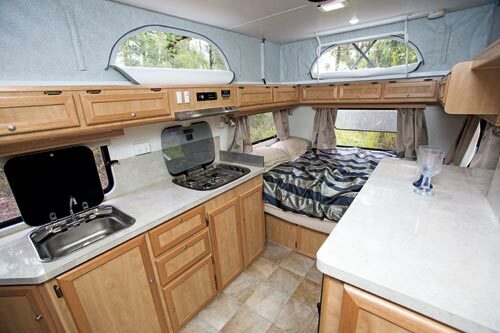 The kitchen sits across the offside wall of the van between the dinette and the bed. 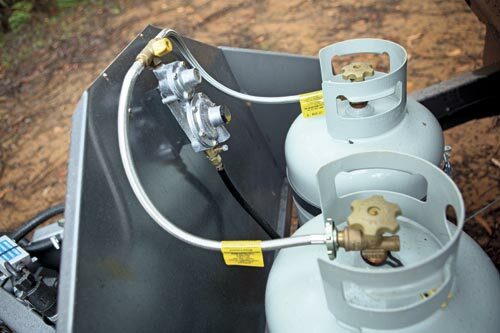 It has good preparation and serving space, particularly if you drop the lids on both the three-burner gas cooktop and stainless steel sink. 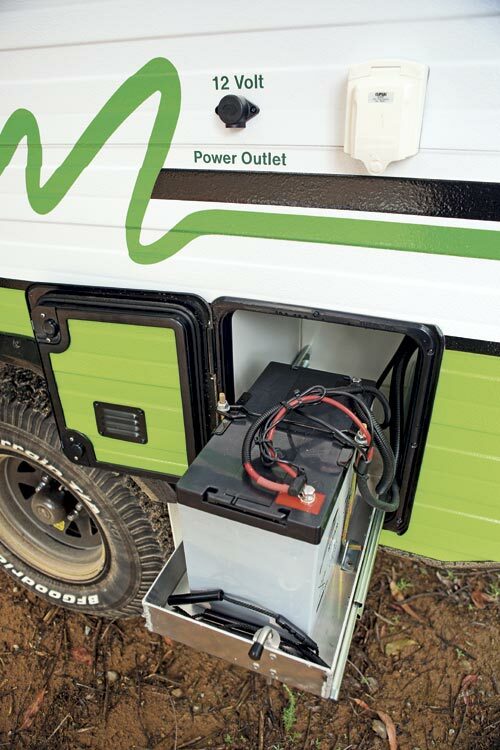 The 90L Dometic three-way fridge opposite is large enough for an offroad van of this type, but perhaps not the 12V compressor-type fridge you’d hope to see in a modern offroad van. 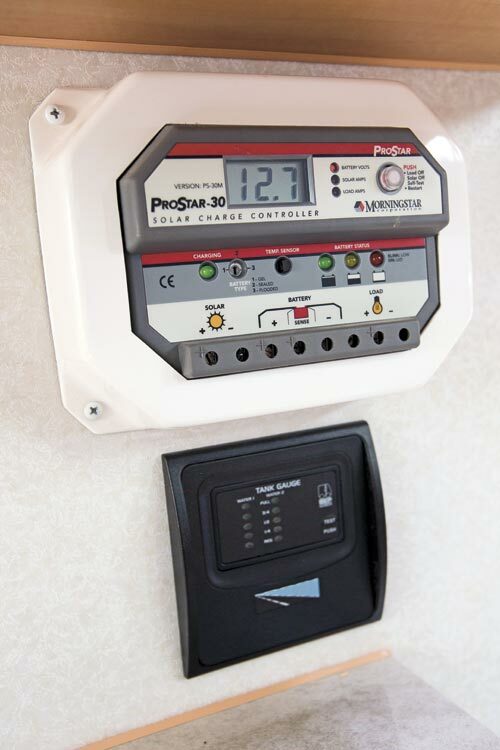 The Gibson comes with a 90W solar panel and an 110Ah battery conveniently located in its own easily-accessible exterior locker. There are two 60L water tanks below, which are very well-protected by stone shielding, with marine ply sandwiched between each tank and its shield to deal with any sharp impacts. 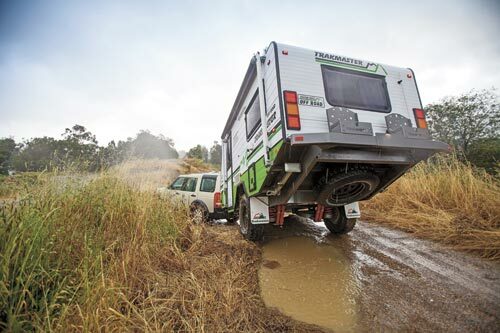 It mightn’t be the newest or highest-tech kid on the unbeaten track, but the Trakmaster Gibson pop-top is an honest and serious offroad traveller at a price that now makes great sense. 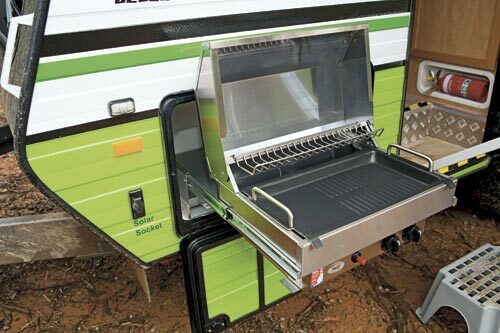 The full version of this review appeared in Camper Trailer Australia #74, March 2014. 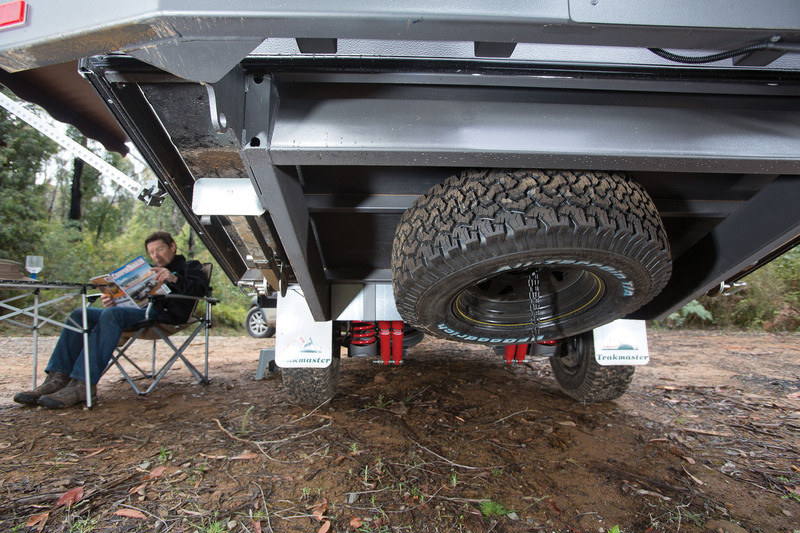 Why not subscribe today for the latest camper trailer reviews and travel features. 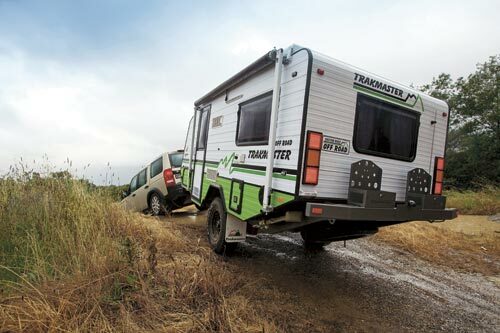 Buy and sell new and used camper trailers at TradeRVs.com.au.